My husband and I both work full time in ministry. We are the proud parents of two teenagers. Often, as a family, we are pulled in different directions. Sports, jobs, theatre practice, music lessons, church events, and so on. We get caught up in all we have to do; all of the people that need us. 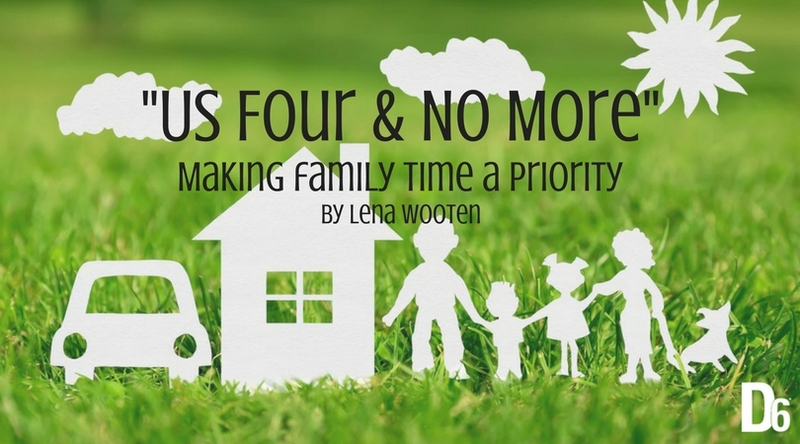 When we start to feel busy or overwhelmed as a family, one of us will say “OK, us four, no more.” That means it is time to hit pause and spend time together as a family—just the four of us and no one else. You can improve the quality of your family time by doing things together as a family every chance you get. The activities can be big or small, planned or spontaneous. It’s just about spending time together. If you are looking for ideas to create quality family time, here are a few activities you can try with your family. Remember, these family time activities do not have to be complicated. Your children just want to spend time with you and make fun memories as a family. Lena has been leading in children and family ministry for 14 years. She and her husband, Josh Wooten minister together at a church in Nashville Tn. Mother of two incredible children,Lena is also the Director of marketing for D6 Family. Lena has an absolute heart and passion for family ministry. She sure does! One of the most down to earth lovely inside and out person I know.